The web we're all used is built on hypertext. This linking of webpages (documents) online powers the search engines that we know and love today. Search engines hunt for contextual text snippets, helping you find relevant documents. Not so with video... As the internet of text has given way to the socially connected internet of video, search simply hasn't caught up. Today, videos online are black boxes. Search engines examine the text surrounding a video to make a best-guess about the value of that video relative to your search term. And videos have to be watched in their entirety — begin at the beginning and end at the end — unless you want to scrub through manually to find the segment that's relevant to what you're looking for. We can do better. We have the technology! Imagine, searching inside a video to find only the parts that are relevant to your query. Imagine, socially connected videos in which every action influence the value of that specific moment of video in realtime. 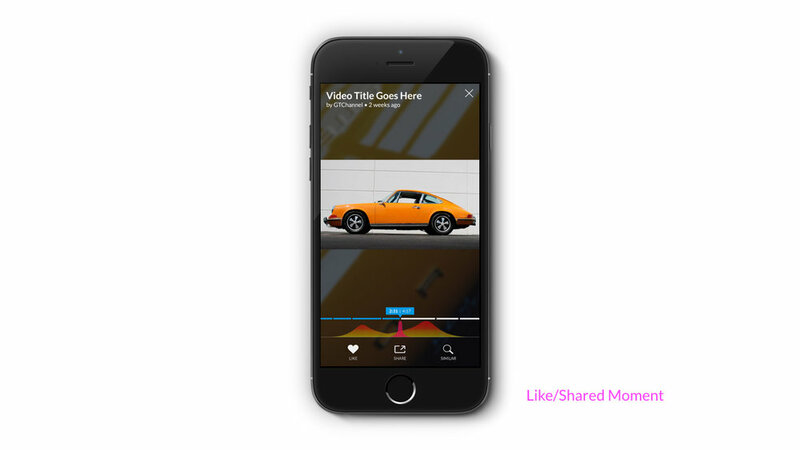 Imagine, smart videos that are linked topically, connected to one another based on relevance, and accessible at the click of a button — no matter whether you want to lean forward or lean back to watch. This is the world I've been playing in and the experience I've envisioned. The designs that follow are version one of a socially connected, smart hypermedia video player. They just scratch the surface of where I believe a true hypermedia experience can take us as we consume content, but they are the first step toward that vision (one that I'd be happy to waste hours discussing). Imagine watching a video and at the click of a button being served up similar segments of other videos that are relevant to what you're watching.